How does dark rye get dark? It starts with the flour; in rye's case, that's pumpernickel. Pumpernickel is the whole grain form of rye flour; it's simply the whole rye berry, ground. Depending on how much of the bran and germ is sifted out, you can buy medium or white rye, as well. A lot of dark rye recipes call for dark cocoas or unsweetened chocolate to get the rich, dark brown, usually shiny-topped loaf you find in delis. Both of those ingredients can be bitter, so dark hued sweeteners are usually called for, too. One other way to make the finished loaf darker and more appealing is caramel coloring. It can be found in powdered form, but it's easy to make yourself; it's simply highly caramelized sugar. Given the quest for a dark, tasty loaf it can be a little confusing as to how exactly to get there. It can be pretty easy to have so many competing flavors going on that the unique personality and taste of the rye gets lost. I took a Slavic recipe that had a pretty lengthy ingredients list and streamlined it; this dough makes a tangy, just slightly sweet bread or boule that's an excellent partner for soup or sandwiches. Rye is rich, tangy and at its best, moist without being gummy. 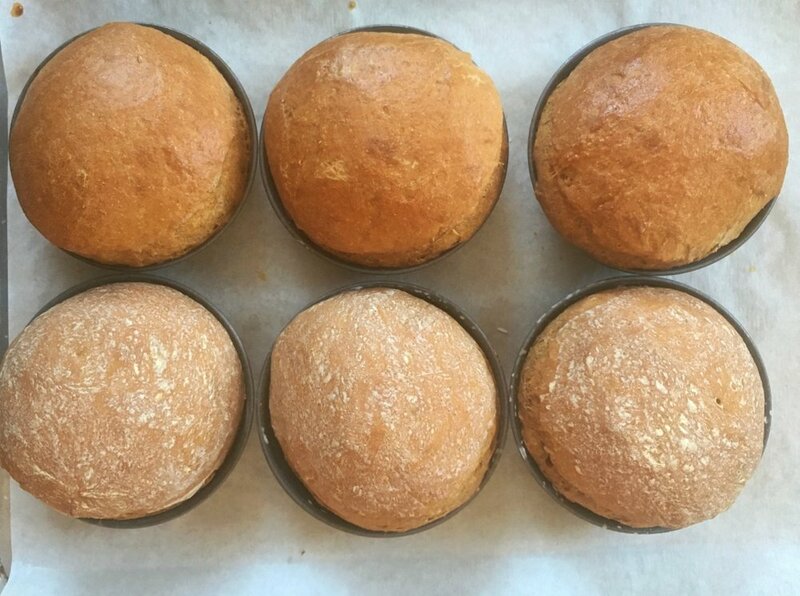 This dough makes two smaller loaves, one substantial boule, or in the case of today's post, six smaller boules that can be hollowed out and used as a bowl for soup or a dip for a party. Divide into 8 pieces, and you'll have the right size for a hearty sandwich or reuben. Hint: before you go to the stove, make sure your stove's exhaust fan is on! 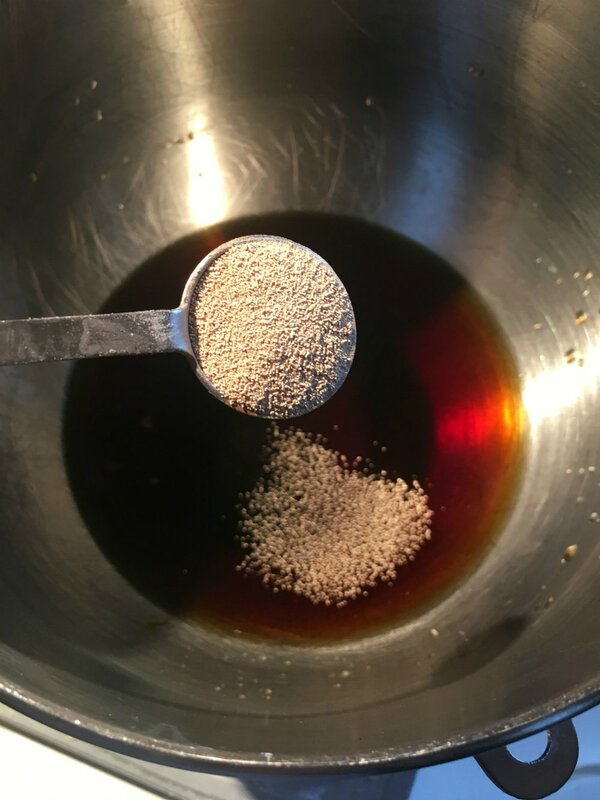 To make the burnt sugar syrup: Put 1/2 cup of granulated sugar in a small, heavy-bottomed saucepan. and place over medium-high heat. Do nothing but wait and watch. The sugar will melt, then start to take on some color. Swirl the pot to even out the melting, but don't stir. 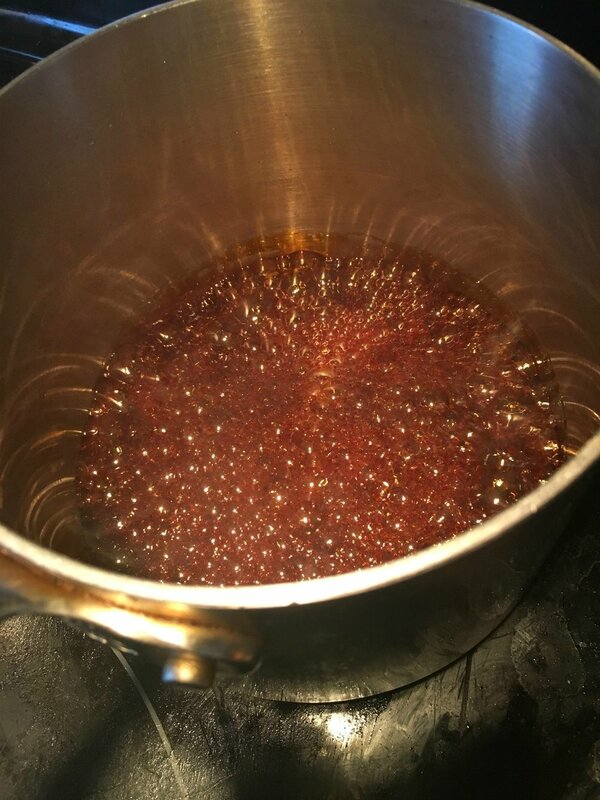 When all of the sugar is melted and a rich brown (but not burned), remove the pan from the heat. Slowly and carefully add 1/2 cup of water to the pan. It will bubble and steam. You can stir at this point to make all the sugar is dissolved. Once the syrup is cooled, it's ready to use. If you have a bread machine, by all means set it on the dough cycle, put all the ingredients except the egg and water in the pan and let ‘er rip. ... and pumpernickel. Give that mixture a stir and walk away for 10 minutes to wake up the yeast and let the bran in the pumpernickel soften up a bit. After this little rest add the salt, softened butter, bread flour, and the fennel or caraway if using. Mix the dough until it comes together. It will be sticky enough that you may have to scrape the sides of the bowl to make sure everything is evenly incorporated. Once the dough comes together, knead it with the dough hook at medium speed for about 8 minutes. See the strings forming in the dough? That's the gluten in the bread flour, which is going to give the bread it's structure. Cover the bowl and let the dough rise for 1 to 1 ½ hours. I managed to forget the caraway, but better late than never! ... as the dough rises and expands, you’ll see cracks in the flour on top. 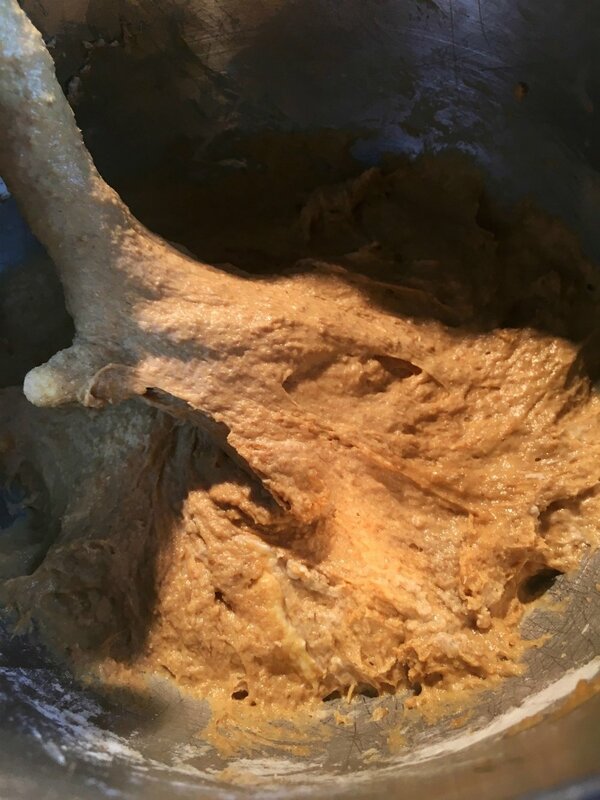 Once the dough looks like this, grease your work surface, your hands, and if you have one, a dough scraper. Turn the dough out, pat it into a log, and divide it into 6 pieces. They’ll weigh about 7 ounces each. Round each into a ball. You can put the rounds right on to a parchment-lined baking sheet. I happen to have a bunch of 4” tart dishes, and thought they’d help ensure nice rounds, so I grabbed them. Let the rounds rise for another 45 minutes to an hour. Brush the tops with beaten egg (or a cornstarch slurry, as mentioned below). Bake them for 30 to 35 minutes. If you have a digital thermometer, the centers should measure 195°F. Remove from the oven and cool on a rack. The top row was brushed with an egg wash; the bottom with the cornstarch slurry. Egg wash: If using an entire egg for a tablespoon or so of liquid to brush on top of the bread makes you crazy, I have two suggestions. The first (if you bake regularly) is to keep a container of egg beaters in the house; you can pour out only what you need, it works like a charm, and there are no lumps of egg white or blobs of yolk to worry about. The second idea is to make a slurry of cornstarch and water (equal by volume). Brush it over the rolls and you’ll get a more matte finish. Working with rye dough is a like giving a chore to a cranky teenager. In order to get the results you seek, you have to meet it where it is. Rye is sticky, and adding more flour to it for your own comfort and convenience is futile. No matter how much you add, the dough is still going to be sticky. Kind of like putting preppy clothes on a purple-haired, multi-pierced kid. Nobody ends up happy.